This howto explains how to build a simple junction with traffic lights. Using this howto and the examples of more complicated junctions you should probably be able to make your own junctions. If you need help with the user interface or termonology, please refer to the usage help. In this howto we will make a junction with two incoming flows that merge to one exit. 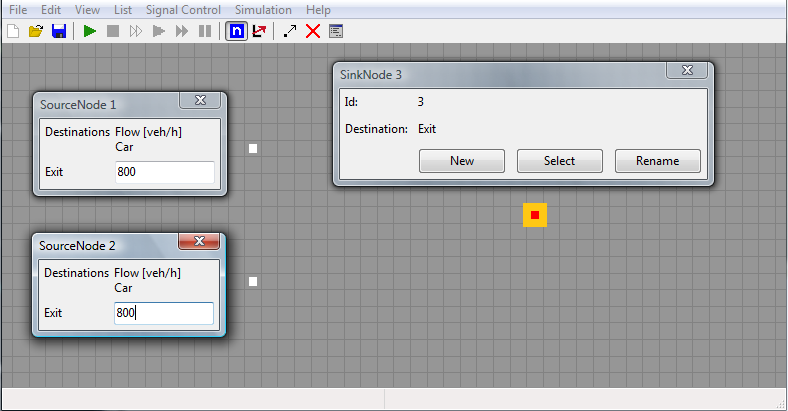 I have started by placing two source nodes and one sink node using the node tool. The default destination name is just the node number which in bigger networks will be hard to remember. 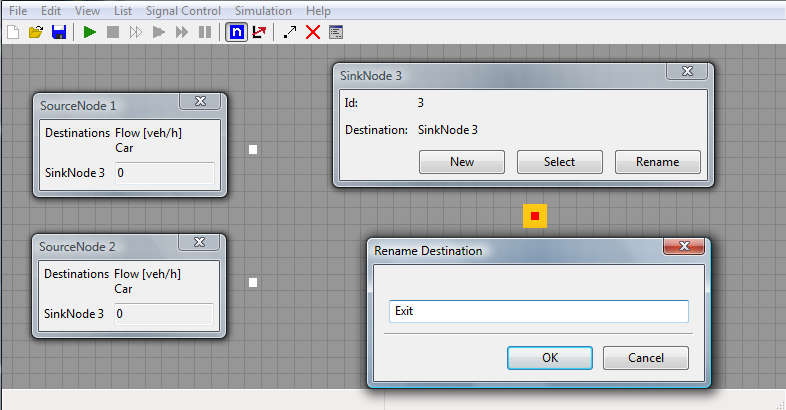 In this example I rename the destination to exit. For each source node you set the flow separately for each destination. In this example we only have one destination. I have chosen 800 vehicles per hour for each of the source nodes. 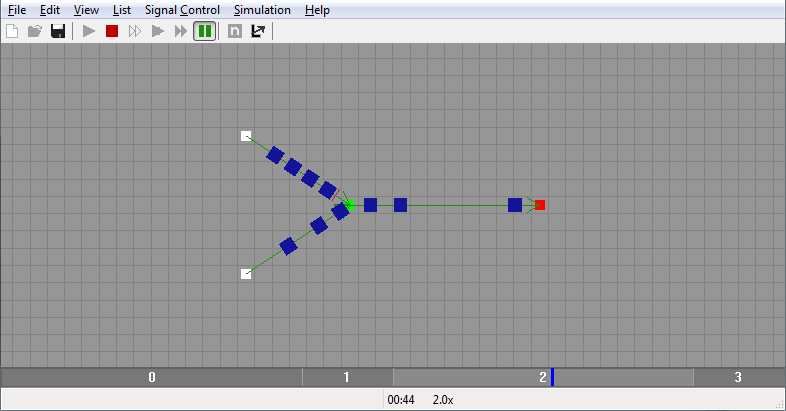 First I construct a link from one of the sink nodes to where I want to have my junction. After that I continue to construct two more links: one from the other source node to the junction location and another to the sink node. The junction node is automatically placed when the second link is placed. 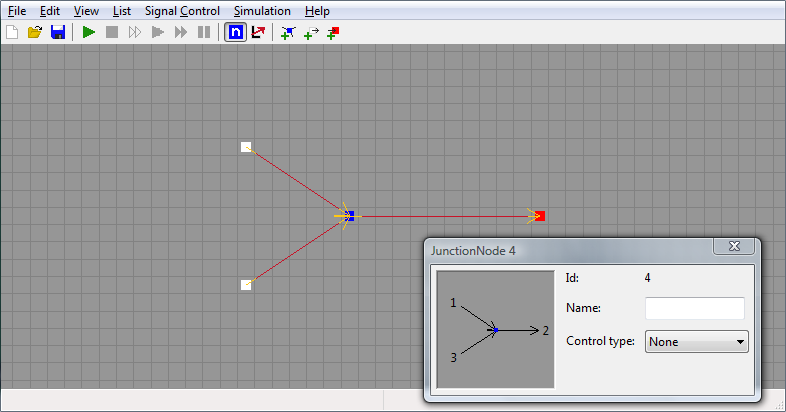 Next, using the node tool, double click on the junction node to bring up the node window. 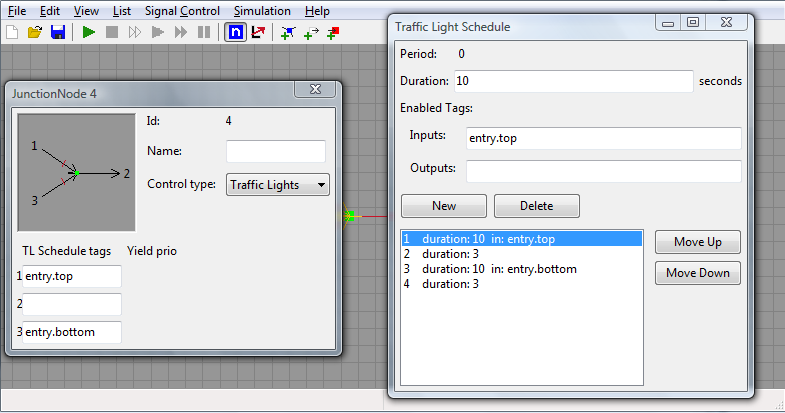 Pick Traffic Lights from the control type list to enable traffic lights on this junction node. Some more controls appear as you can see on the next screenshot. I have entered one tag for each of our two incoming links: entry.top and entry.bottom. The dot in the name has no special meaning but can be used to organize your names as you see fit. The numbers to the left of the tag edit boxes corresponds to the numbers in the figure at the top left of the junction node window. These numbers are calculated on the fly based on the angle of the incoming and outgoing links so they change if you rearrange your junctions. An entry or exit that you do not assign a tag will always be green. Since there is only one exit and no need to give partial green to only some exits in this junction, I have not given a tag to the exit. In the 3-way_junction.xml example file you can see how output tags can be used. I have created four periods. 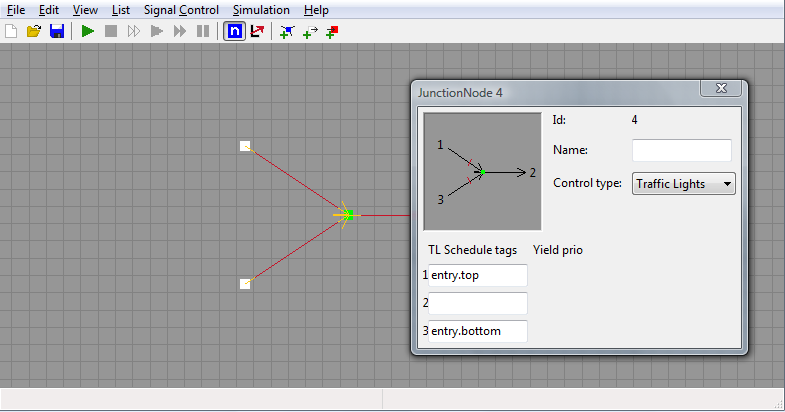 The first one gives green to all inputs on any junction node that is tagged entry.top. The second period is a three second long all-red period to clear the shared area and to account for red-light drivers. The third and fourth periods are similar to the first and second, just that the other input is given green. Now the junction has been constructed and a traffic light schedule has been created. 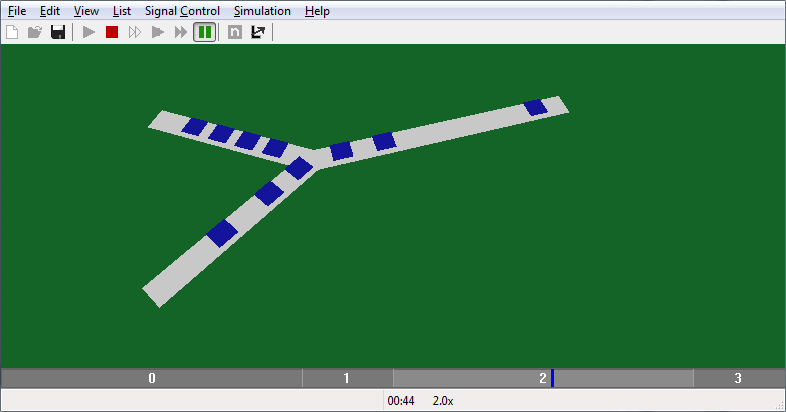 To test the junction, start simulation (Simulation -> Start). Then wait some time and watch the first vehicle arrive. 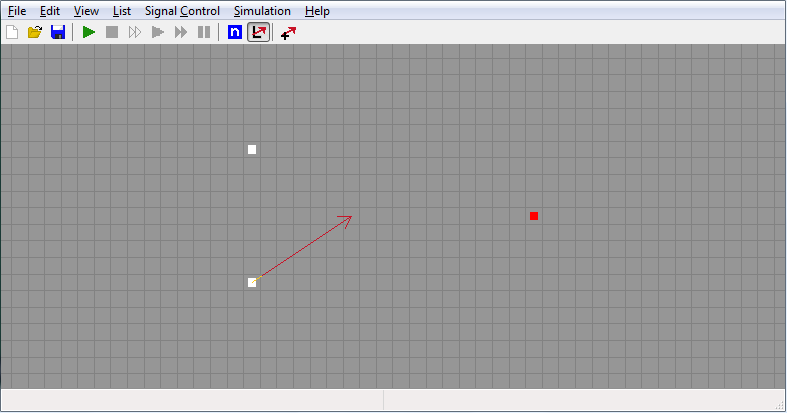 View -> Camera Control Window -> shows controls to rotate, tilt and zoom the camera in 3D-mode. Hold a button depressed for continues changes. You have now created a fully working example. It has nodes, links, vehicles that arrive and a traffic controlled junction so that cars don't collide. The final result is located in the junction_howto.xml file in the examples folder. You may also take a look on the other examples and examine how they are constructed. To expand, you could try to add a third input arm with a sink that generates traffic. Another expansion that you could try is to add a new exit arm from the junction node with a new sink node. Click on the existing source nodes and assign some new traffic flows to the new destination.